Impossible to pull? Then let’s push! 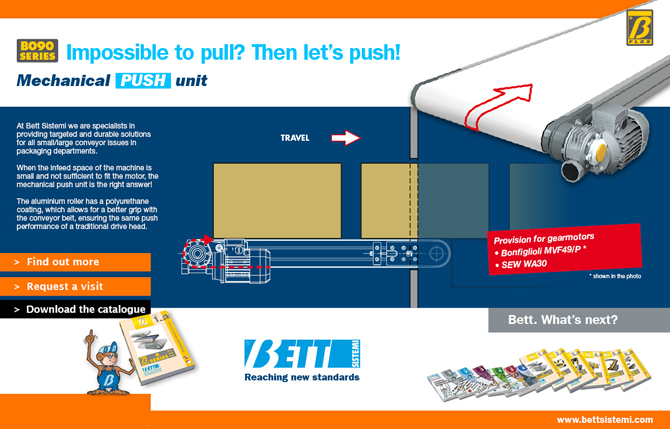 At Bett Sistemi we are specialists in providing targeted and durable solutions for all small/large conveyor issues in packaging departments. When the infeed space of the machine is small and not sufficient to fit the motor drive, the mechanical push unit is the right answer! The aluminium roller has a polyurethane coating, which allows for a better grip with the conveyor belt, ensuring the same push performance of a traditional drive head.